This silver plated card holder is made of alloy metal and measures 1 5/8' H. It is sold in packages of 8. Use with table numbers, photographs or any other stationery of your preference. 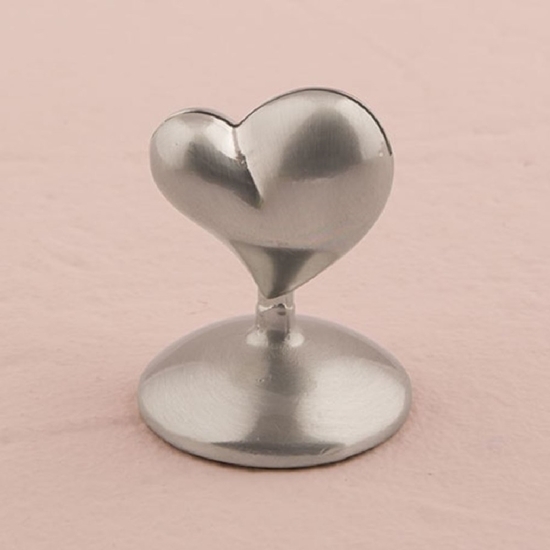 This stationery holder features a silver heart to capture the hearts of your guests. Because hearts are very symbolic when it comes to love and all things romantic, this ornament features a design that is perfect for weddings. As our heart beats very quickly for the ones we love, use these stands to display photographs of the bride and groom to showcase their love for one another. Use its small stature to allow for a small-scale exhibition on reception tables, an extra touch of romance.